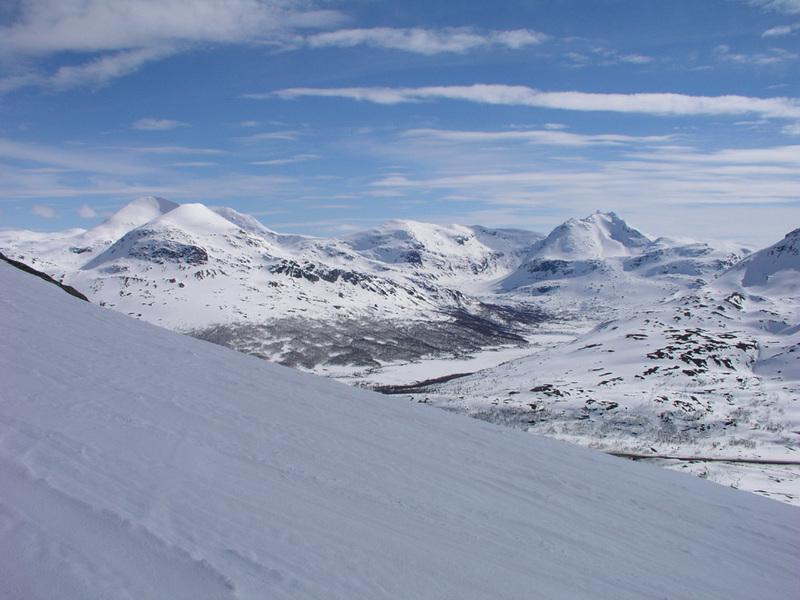 How to get there: This peak is located between Gratangen and Lavagen in Southern Troms. From Tromsø, head south on Hwy. E8, then E6 to Fossbakken. This is 190 kilometer from Tromsø. From Fossbakken, contine approximately 6 km south on E6 and locate parking on an old section of the road (that has been eliminated). This is near the highest point before the road starts descending towards Gratangen. This trailhead has location north 68:39.939, east 017:50.253, with an elevation of 426 meter. 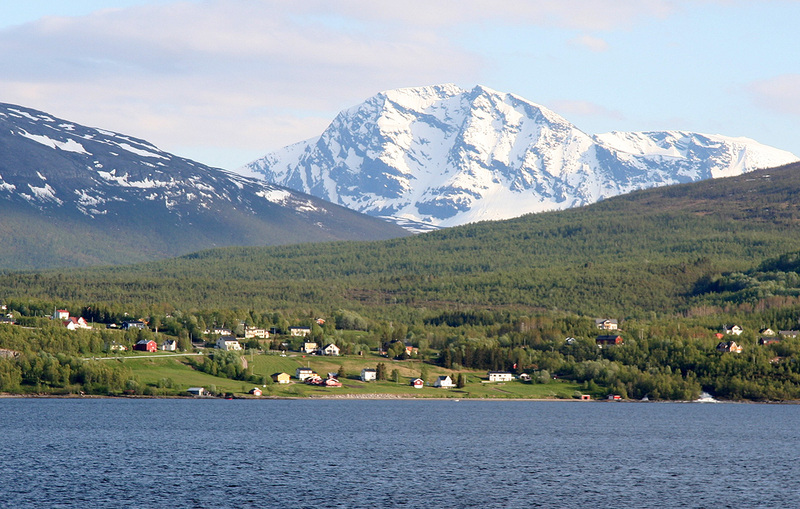 From Narvik, the corresponding distance north along E6 is approximately 54 kilometer. Route description: In summer, the map indicates a trail (most likely marked with red paint) from the trailhead to the summit. In winter, the route essentially follows the same path. First, fairly straight north to about 700 meter of elevation, then gradually a bit more to the north-east as oe follows the natural features of the mountain slope. Higher up, a nice ski route will climb in a large ascending curve turning left. This way, one can keep the slope pretty constant and arrive at the summit plateau more or less from east. 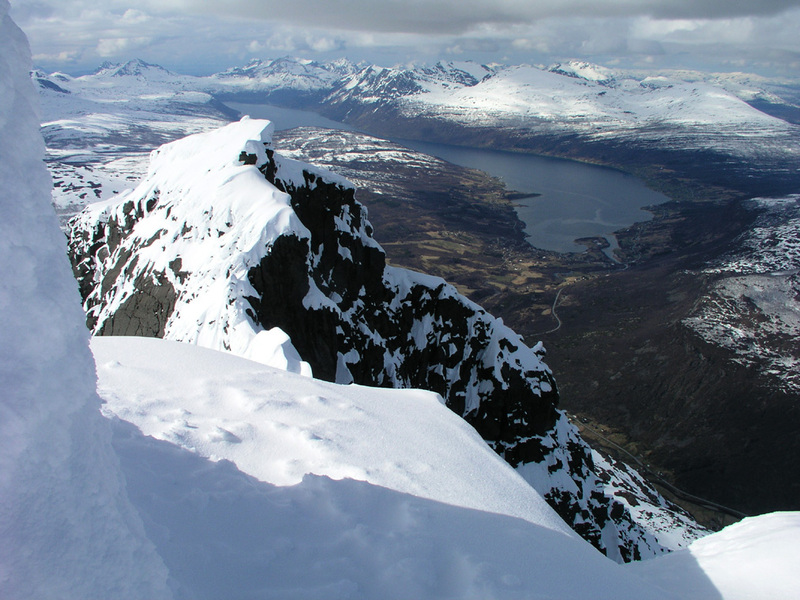 The summit is at the end of a short, but fairly wide (and flat) ridge, one can ski all the way to the cairn. Comments: I climbed this peak solo. 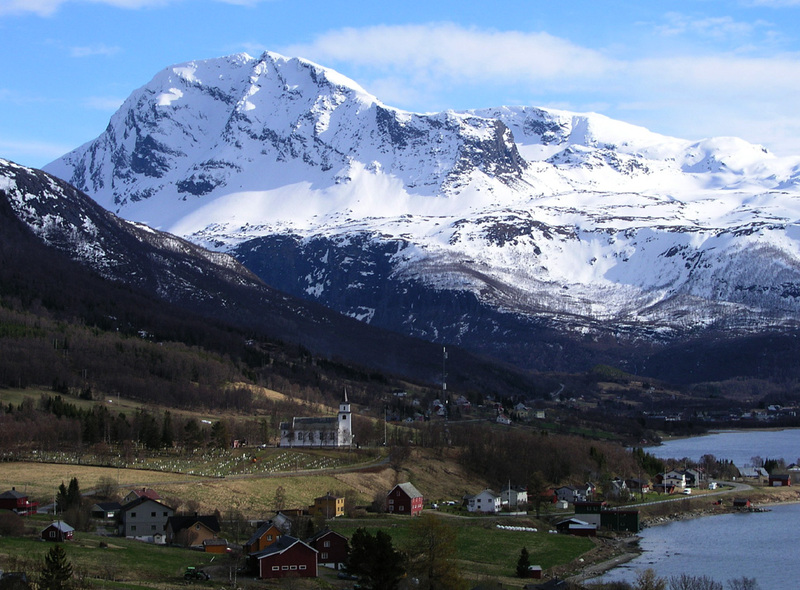 Having climbed Sætertinden with more than 1000 meter vertical gain in the morning, I was now driving across to Sjøvegan where I planned to stay, then climb Spanstinden the next day. However, as I came to the trailhead the weather was still fantastic despite a very bad forecast. I simply could not let this opportunity go, parked the car and prepared for a second big climb this day. I left the trailhead at 1310, had a slight delay after half an hour, because of a bleeding nose. Quite annoying since I did not really have anything to stop it with, well stopping and bending backwards did the trick and after 10 minutes I could resume the ascent. I arrived at the nice cairn at 1525, so 2:15 including the stop. A very nice summit with spectacular views in all directions. There are very steep drops both north and west. This summit even had a summit register. I signed in and spent another 15 minutes just taking the scenery in deep breaths. The skiing down was fun, almost waterskiing towards the end, if you loose speed you fall through the very wet and rotten snow. Back at the car at 1630, so only about 50 minutes for the return. This was peak number 13 in my T5 trip. Next peak Løksetind. Previous peak Sætertind. Spanstinden. Seen from Hwy. E6 (from the south west). Spanstinden. Seen from the trailhead. 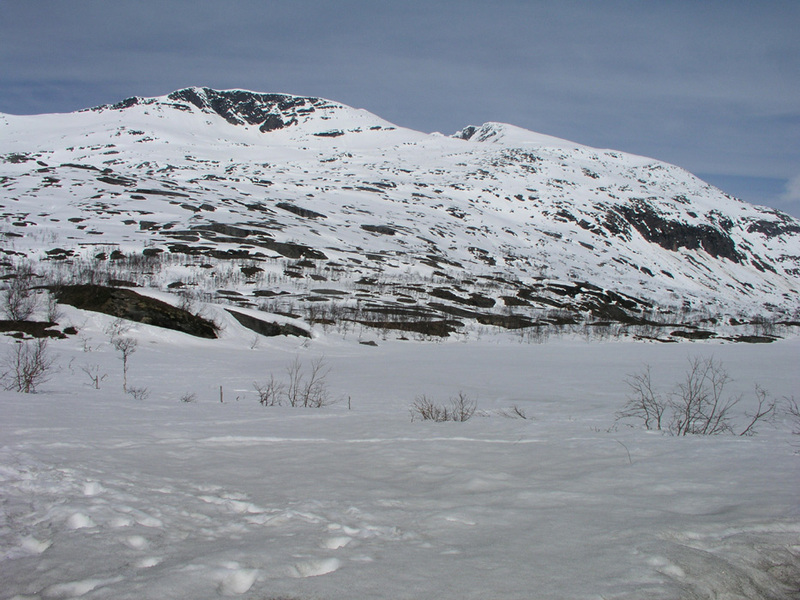 The summit seen from the saddle to Sølvfjellet. 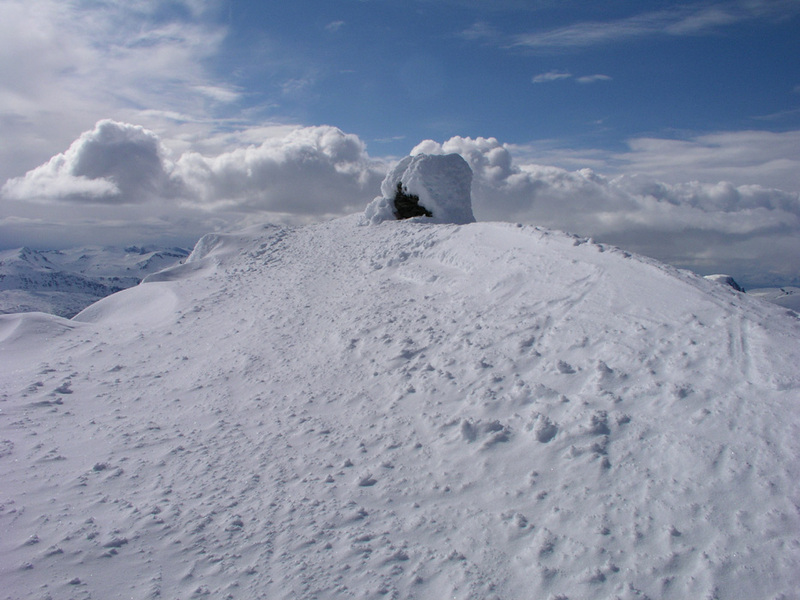 The summit cairn. A nice location. 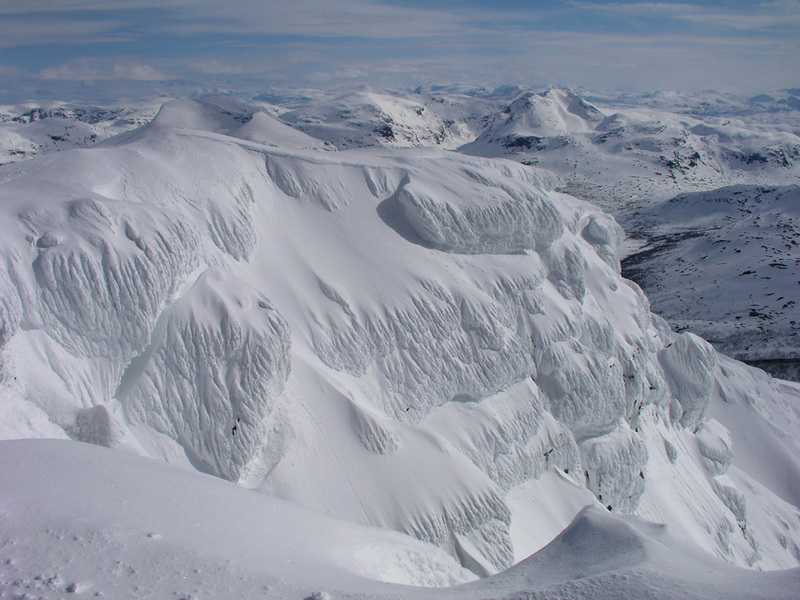 Summit view, to Spansdalen and Lavangen. The west ridge. The drop to Fossbakken exceeds 1200 meter.